Traffic lights, also known as traffic signals or stop light, is a signaling device that is positioned at a road intersection, pedestrian crossing, or other location to indicate when it is safe to drive, ride, or walk using a universal color code. The color 'red' on the signal light indicates to stop well before the stop line and not to crowd the intersection. Turn left in a red signal only when there is a sign to do so. While turning, yield the right of way to pedestrians and vehicles coming from other directions. 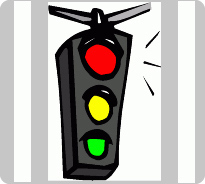 The amber (or yellow) light indicates to clear the road when the signal is changing from green to red. If, by mistake, caught in the amber signal in the middle of a large road crossing, continue with care and do not accelerate in panic. The signal light 'green' set you to go but be careful while on the start of move. Check whether vehicles from other directions have cleared the road. Suppose you want to turn left or right, check the signal whether it allows or not separately. If yes, turn but yield the right of way to pedestrians and vehicles from other directions. This indicates to proceed with caution in the direction the arrow points. Remember to yield to all pedestrians and vehicles already in the intersection. Flashing red means to come to a complete stop. Do not forget to yield to all other traffic and to pedestrians. Proceed only when the way is clear. Flashing amber indicates to slow down and proceed with caution.